1881 census...Charles  was at 97 East Road, Cambridge with his father Arthur , umbrella maker; sisters Phoebe  and Bertha  and brother Arthur . All the children were born in Cambridge and all have a mother with the maiden name of BROWN. Have not found his mother. The following details are seemingly accurate but his earlier history is still a bit unsure. At this time a Tryphosa Symonds, born 1877, daughter of Thomas and Caroline Symonds, was in Kirtling (1881 and 1891 census) She had a sister Tryphena, but it looks as if the 'Try' part of their names was discarded as they grew older. 1891 census...Charles  was an errand boy living at 16 Abbey Street, Cambridge with his parents, father now a Hawker, and mother named as Eliza; brother Arthur and sister Bertha. He now has additional sisters all born in Cambridge, Eliza; Emily ; Hannah  and Dorca . The family name is transcribed as Groy. His widowed mother was at 100 Tyers Street, Lambeth with his sisters Berth; Eliza, Emily and Dora. On the 27th February 1904 a Phosa Simmons was transferred from Newmarket Workhouse to Lambeth workhouse, aged 25. but discharged that day. It has to be recognised that the Workhouse could also be a form of medical centre. Phosa Gray was on the electoral register in Lambeth, at 37 Glasshouse Street in 1920. The Newmarket Journal carried the following Memoriam Notice on October 30th, 1915. 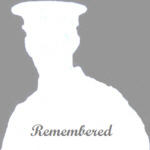 GRAY - In loving memory of my dear son, Charles William Gray, who was killed in action October 28.1914. As time goes on we miss him more. Not one can fill the vacant place. He answered his name at the last roll call. From his loving mother and sisters. He was in the 4th Suffolk Militia and then enlisted in the Bedfordshire Regiment (# 4660) on 25th September 1893, 5'6" (167.6 cm)tall and weighing 118 lbs (53.7 kg), chest 33" to 35" (83.8 to 88.9 cm). He seems to have added one year to his age, which he gave as 18 years 6 months on enlistment. 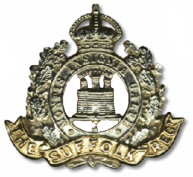 He was transferred to the 1st Battalion, Suffolk Regiment (#3688)on 9th November 1893 but discharged medically unfit on 20th April 1895. The diagnosis was Scrofula, which is a tuberculous infection of the lymph nodes in the neck and is curable. At that time his family were father, Arthur, and mother Eliza, elder brother Arthur (1st Battalion, Suffolk Regiment) and younger sisters Eliza and Bertha with an address at High Street, Newmarket. His medical condition must have improved as he re-enlisted (Soldiers Died has in London, Soldiers Effects has 18th August 1914, in Cambridge) and was sent immediately to France. The 2nd Battalion (as part of 14th Infantry Brigade, V Division) had sailed for France on 13th August and went immediately to Le Cateau. Then they marched to Belgium and got as far as the Mons-Conde Canal. The Germans proved too strong and the Retreat from Mons began. The 2nd Suffolks were part of the rearguard and their valiant efforts back at Le Cateau helped delay the German advance and buy more time for the rest of the Division. This was at the cost of 720 killed, wounded or missing. The retreat ended on 5th September and the British started a counter attack. 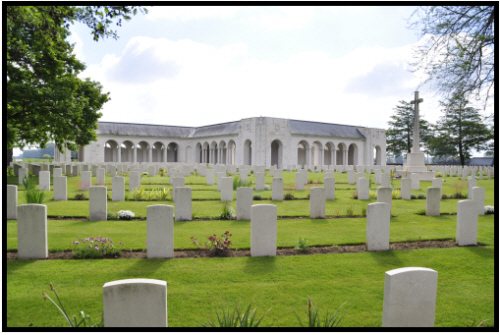 On the 27th the battalion relieved the 2nd Royal Scots in the line between Neuve Chappelle and Fauquissart. Although the enemy was quiet on this part of the front, their snipers were busy, this must have been how Charles met his death. Mrs. Arthur Gray, of 17 Warrington Street, Newmarket, has received from her daughter-in-law, Mrs Charles Gray, of London, the sad news of the death of her son, Mr.Charles Gray, who was a private in the Suffolk Regiment. 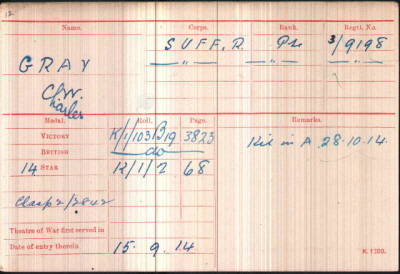 Mrs.Charles Gray received information from the War Office that her husband was killed in action on October 28th. Since then she has received no further particulars. Mr. Charles Gray was very ill early in the year, and was obliged to leave his work and come to his mother in Newmarket for rest and a change of air. He was so ill that great surprise was felt when it was known that he had been accepted for the Army. He had served his period as a Reservist, and the Government had no claim on him, but he volunteered his services and they were accepted. He has found a soldier's grace, fighting in his country's cause. he leaves a widow and five children.